A telephoto zoom designed for use in trying conditions, Fujifilm's XF 50-140mm f/2.8 R LM OIS WR Lens is a weather-sealed optic spanning the popular 76-213mm 35mm-equivalent focal length range and featuring a constant f/2.8 maximum aperture. Built for Fujifilm X-mount mirrorless digital cameras, this fast zoom further extends itself through the incorporation of a sophisticated lens design, highly effective optical image stabilization system, and a Triple Linear Motor AF system for refined performance. Comprised of 23 elements in 16 groups, the optical design incorporates five extra-low dispersion (ED) elements and one Super ED element to markedly reduce chromatic aberrations and color fringing throughout the zoom range. Additionally, a Nano-GI coating has also been applied to elements to alter the refractive index in between elements to minimize surface reflections and prevent lens flare and ghosting. 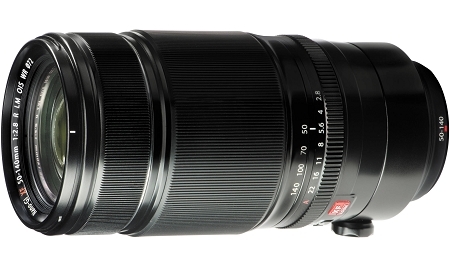 Additionally, this lens sees the incorporation of 20 distinct weather seals across the barrel to render it both moisture and dust-sealed for use in inclement conditions as low as 14°F. An inner focusing and inner zoom design also help to prevent dust from entering the lens while also benefiting overall handling. Providing a 35mm-equivalent focal length range of 76-213mm, this telephoto zoom lens is ideal for working with distant subjects and portraiture applications. Constant f/2.8 maximum aperture enables consistent performance throughout the zoom range and excels when working in difficult lighting conditions. The 23-element-in-16-group design includes five extra-low dispersion elements and one Super extra-low dispersion element to minimize chromatic aberrations and distortions throughout the zoom range. A Nano-GI (Gradient Index) coating has been applied to lens elements and alters the refractive index between the glass and air in order to better suppress lens flare and ghosting for diagonal incident light. An HT-EBC coating has been applied the entire surface of each element to for controlling ghosting and flare for greater image clarity. Complemented by an enhanced gyro sensor and unique series of algorithms, the optical stabilization system minimizes the appearance of camera to enable sharper imaging when working with longer focal lengths or slower shutter speeds. A Triple Linear Motor autofocus system delivers smooth, near-silent performance that is especially beneficial to video applications and when working in noise-sensitive areas. A tripod collar is included for well-balanced mounting and shooting when working from a tripod or monopod. An inner focusing and inner zooming design maintains the overall lens length during operation for quicker performance and greater resistance to dust or moisture from entering the lens. Additionally, 20 distinct seals are placed across the lens barrel to render it weather-resistant and capable of functioning in temperatures as low as 14°F. Seven rounded diaphragm blades contribute to a pleasing out-of-focus quality to benefit the use of selective focus and shallow depth of field techniques. When used with an X-series camera that features a Lens Modulation Optimizer (LMO) function, the lens' performance is enhanced to deliver consistent illumination and sharpness throughout the aperture range.